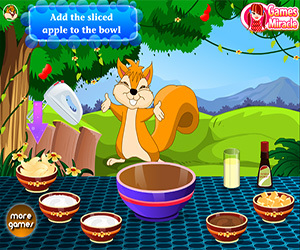 If you want to know how to prepare a fantastic Apple Cobbler try to play this cake game! The squirrel will drive you through the entire process. First step is to pick up all the needed ingredients from the supermarket. The squirrel indicates you what to purchase: flour, oranges, vanilla extract, lemon juice, salt, butter, ginger, sugar, cinnamon, heavy cream, apples and baking powder! Now you can start cooking! Take sliced apple, sugar, cinnamon, butter and vanilla extract and add them into the bowl. Take the mixer to mix all together! Take another bowl and add sugar, flour, baking powder, salt, butter, crystallized ginger and zest orange. Then use the mixer! Add heavy cream too and mix again! Now we will shape the pot to get the cobbler! First, transfer the apple mixture from one bowl into the pan and then cover that with the cream mixture. Finally, cook! Switch the oven on and wait. After some minutes the delicious apple cobbler is ready! Tasty?! A very funny game! Isn't it? Play it now!